Can I install solar panels now and add battery storage later? 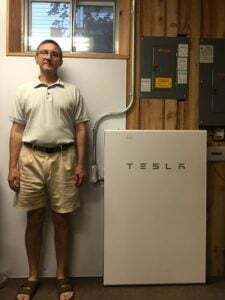 A Solar United Neighbors of Maryland network member shows off his battery system, which he paired with an existing rooftop solar array. Absolutely! Many home and business owners chose to go solar today – leveraging the immediate cost competitiveness of solar to start saving money on their electric bills – and install batteries in the future, once hardware costs fall. There is nothing that prevents you from adding battery storage to an existing solar array. This arrangement is called a “storage retrofit.” There are a few important hardware considerations (including whether to AC- or DC-couple the system, and the most appropriate battery inverter for the desired coupling configuration) and financing considerations (federal tax credit eligibility) for storage retrofits. We detail these considerations in our free Battery Storage for Homeowners guide. Download the guide today to learn more about retrofitting an existing solar array with batteries!